Few things make me glow brighter than a proper tea. Mom and I have actually traveled to some fun places while I was growing up for High Tea. Spots like the Plaza in New York or the Empress Hotel in Victoria, Canada. It was even part of my etiquette curriculum in Finishing School. How to pour tea correctly (opposite hand always on lid), how to serve jam (on the plate with the provided spoon, never on scone), and the correct order in which to devour goodies (savory to sweet, not the reverse). There wasn’t a lesson on how to surprise Valets though. When in Canada, the Empress Valets weren’t quite sure what to do with our rented Vespas…! 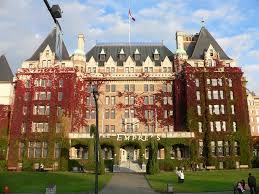 Empress Hotel in Victoria, Canada. Still Queen of High Tea. As I’ve grown older, my love for the ritual in a good tea has only cemented in the way of a WASP of British decent (albeit in 1622). I love the harmony and elegance of dressing up for friends and female family in pearls and heels to toast each other with piping hot Earl Gray and enjoy coiffed tea sandwiches, strawberries with creme freche, scones topped with fruit compotes, mini chocolate cream eclairs, and the very languid joy of proper Champagne. Another etiquette lesson: the fine Champagnes made in the Methode de Champenoise have small, almost teeny bubbles of effervescence. Today, I felt inspired by old pictures I found of tea parties past with my Mom and grandmother, Mima. Every Christmas we invited friends, family, and members of the community we respected and admired. Girls only. We’d slave for days baking and copying tea sandwiches from old recipes. 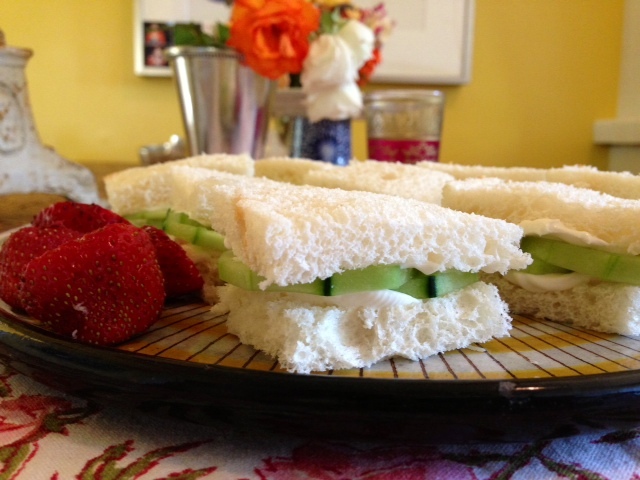 Today, Anni asked to play “tea party” and I made an old favorite: Cucumber Tea Sandwiches. But you don’t need a little girl to enjoy this treat. Sitting with an iced tea and a book in the garden shade sounds beyond heavenly! 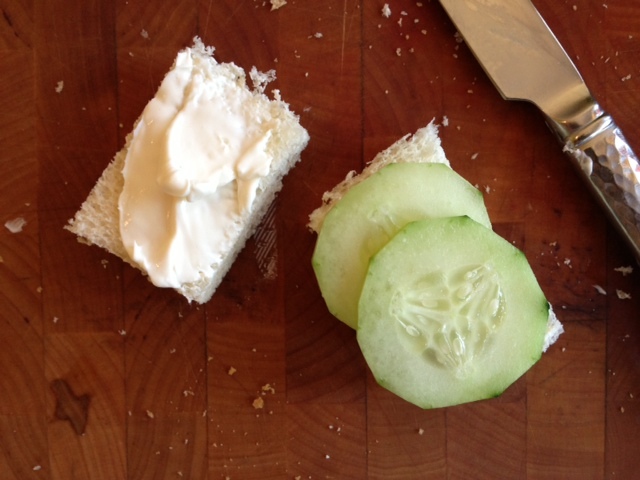 Thinly slice cucumber into pretty, almost translucent rounds. Trim crust from the white bread. Cut into cute, 2-bites sizes. 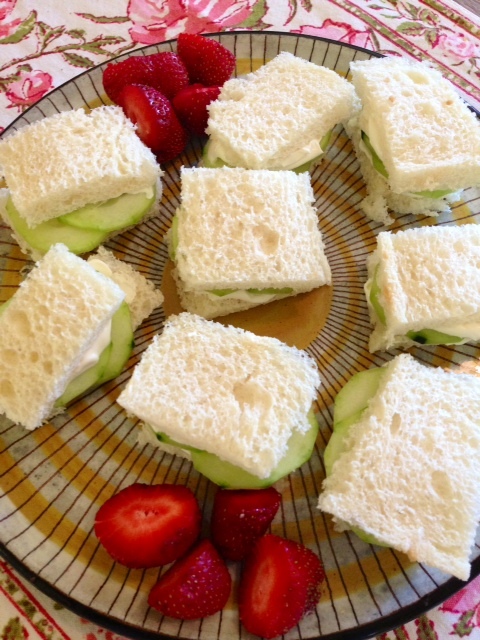 Lather cream cheese in a light creamy layer on each side of the lttle sandwiches. Arrange on a cute plate and serve with flair! If you have iced tea or champagne in the fridge, go for it! Ready! Prep time: 5 minutes. NOTE: If you’re making these more for a grown up crowd, I’ve started garnishing salads and sandwiches with Microgreens. 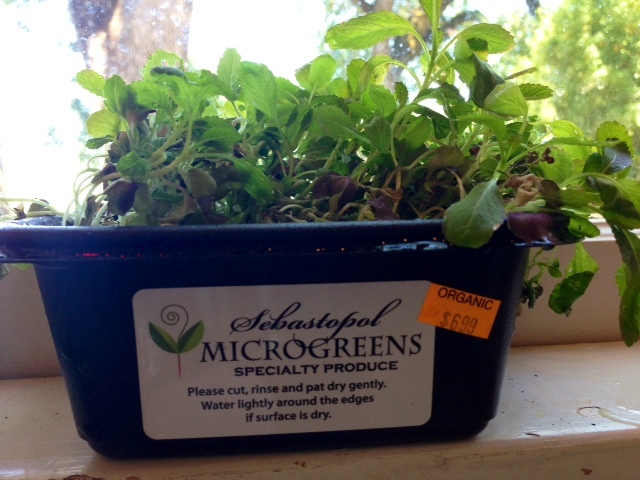 They apparently are wonderful for your health but I love the peppery crunch they add, especially to my little cucumber tea sandwiches today. 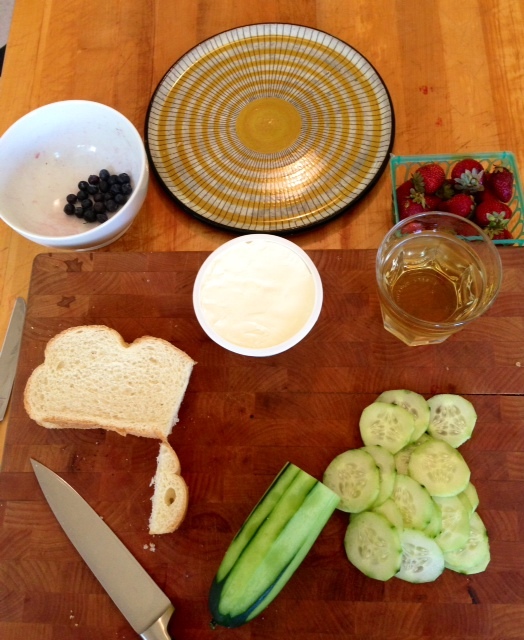 This entry was posted in Breakfasts and Brunch, Entrees, Uncategorized by Abigail. Bookmark the permalink.